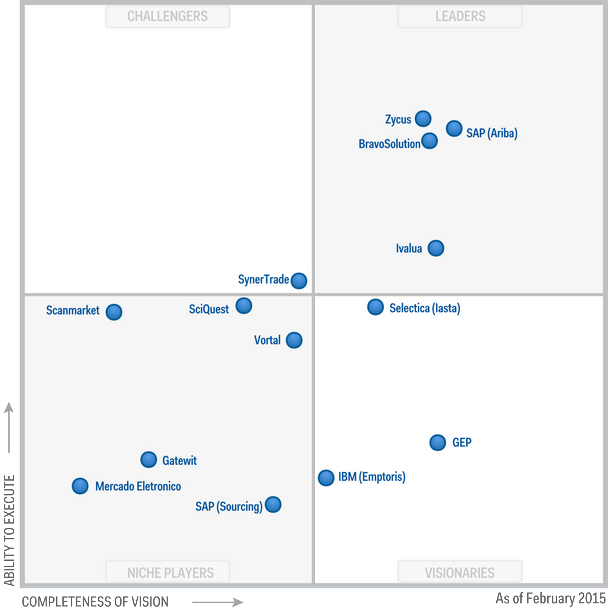 Gartner’s 2015 Magic Quadrant for Strategic Sourcing Application Suites, a significant leap for Ivalua! Ivalua stood as a leader in both completeness of vision and ability to execute among the 14 different solution providers reviewed by Gartner, Inc., for the most recent Magic Quadrant on strategic sourcing application suites. This report examines a wide range of upstream procurement functionality including Spend Analysis, e-Sourcing, Contract Management and Supply Base Management. Gartner, Inc., Magic Quadrant for Strategic Sourcing Application Suites, Deborah R. Wilson, et al, Feb, 2015.